the chickens. Not one bit afraid. We camped in Hatfield, Wi on Lake Arbutus. We had tons of fun! A beautiful day at Bible camp. My Grandson, Christian took this photo of me. He was there helping us at camp. He was a counselor and in charge of recreation. Reighlynn, my youngest granddaughter was there for her first time as camper. 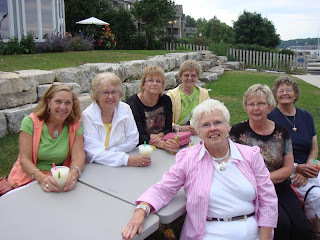 My gang that I went to Door County with in July 2009. We had a great time! Shopped alot!